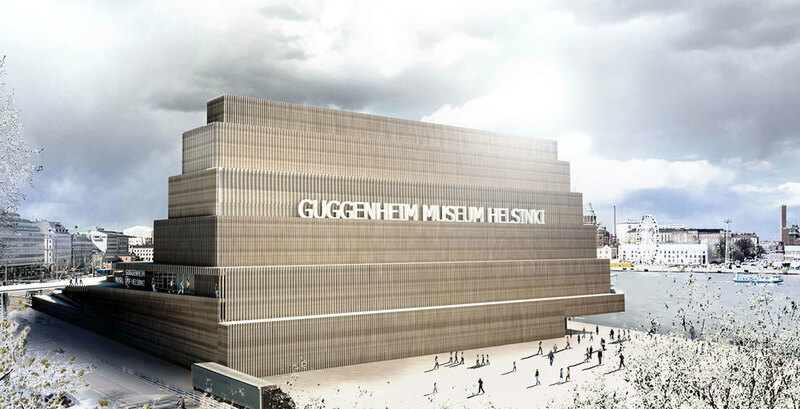 What should the Helsinki Guggenheim museum look like ? What are the current practices that defines contemporary art forms ? How the museum’s architecture can be the witness of these evolutions and which configuration is the most suitable for modern, contemporary design and art? Simple forms such as warehouses are popular places among Artists for work and exhibition. These simple and spacious constructions are the type that we have chosen to explore for this design.This intention must be rethought through these contemporary processes that had revolutionized the artistic creation : mixing and sampling. 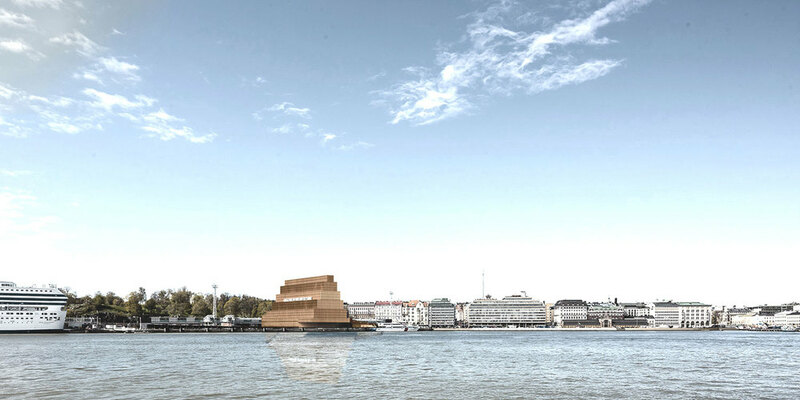 The museum project is a warehouse mixed with landscape components of the harbour : the islands that form the horizon of the Helsinki bay. The new museum is an hybrid form, a friendly chimera under the form of a quiet monolith.The project proposes a strong architecture, perpendicular to the built front of the docks, allowing unobstructed views toward the sea. It forms a vertical signal, clear and recognizable from the port or while arriving by the sea. The museum stands as an object on the dock. Still, it is written as the interface between the distant landscape and the physical location of the project. It designs a square edge that articulates several outdoor spaces: the port, the roads, the pedestrians routes, etc. The particular shape of the building connects the dock to the park via a footbridge and creates a public square facing the harbour and protected from the traffic flow. This public space is a genuine esplanade for the museum, distributing its entrances and allowing outside events. 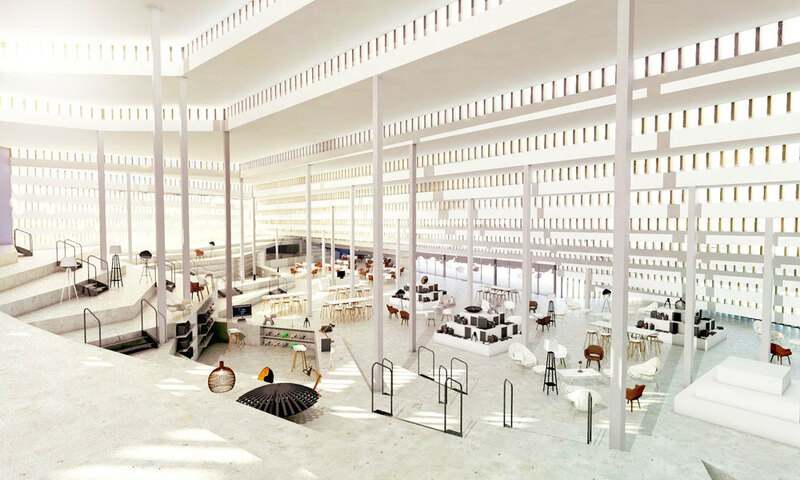 The ground floor essentially consists in the hall-atrium (multi-purpose room), the public reception, the design store, and the restaurants. 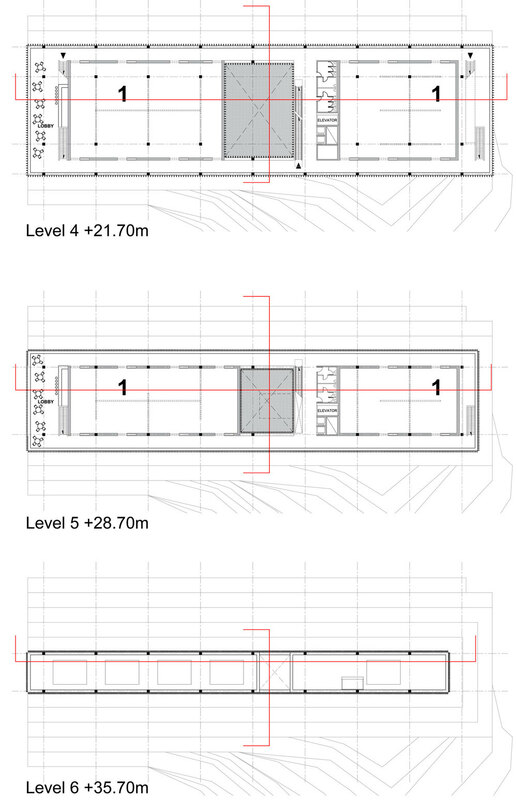 These interior public spaces include a accessible topographical part, which contains underneath and separate from the public spaces all the rooms necessary to the operation of the museum(offices, storages, kitchens). It takes shape in mineral bleachers that allow, as on a hill, to sit, to expose furniture and sculptures, but also to reach the exhibitions spaces or to access the footbridge that leads to the park. Our proposal for this space is one of a concept store where the restaurant, the design store, the café mix. At the entrance, the multi-purpose zone and the flexible performance / conference hall are in contact. By opening them, they form a continuous space that gives a high practical value and a rich potential during public events. The multi-purpose zone takes the shape of an atrium, its great height allows a rich array of artistic interventions, while connecting visually the different levels. Exhibitions galleries are genuine “white box” spaces with large heights and natural lightning. Motorized sunshades allow to regulate the light. 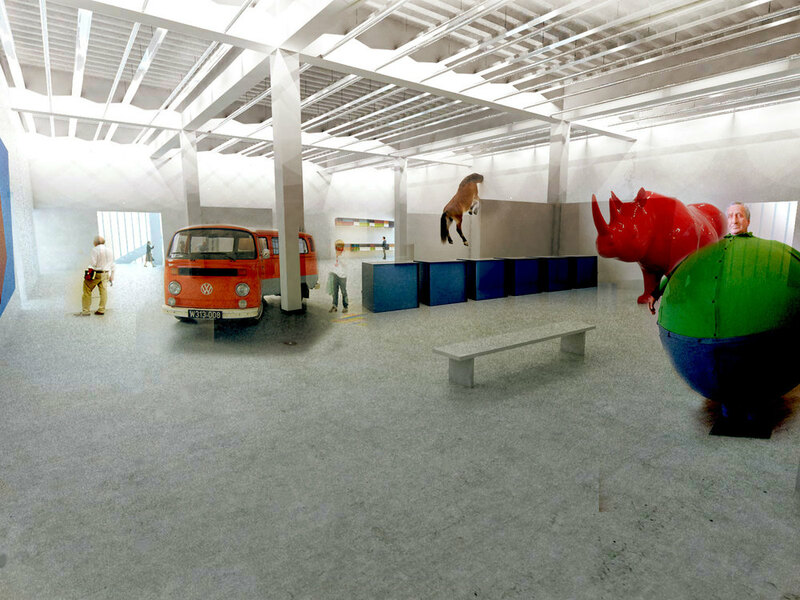 The internal corridors and the galleries can be modulated, allowing more flexibility for the exhibitions. On each floor a lounge space is implemented, facing the harbour. The circulations allow the visitor to always have in sight the landscape of the city.